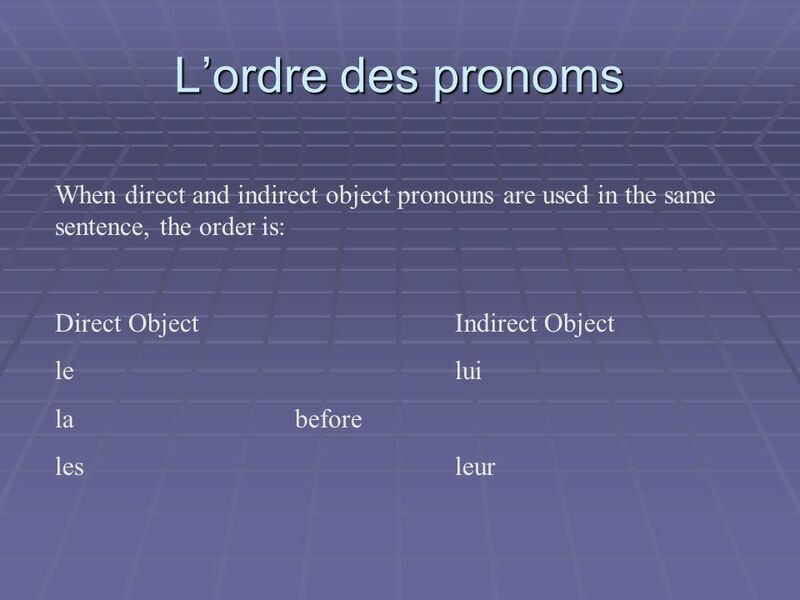 Lordre des pronoms When direct and indirect object pronouns are used in the same sentence, the order is: Direct ObjectIndirect Object lelui la before lesleur. 2 Lordre des pronoms, p. 229 Tu donnes ta photo B ta copine? Yes, I give it to her. Oui, je la lui donne.Yes, I give it to her. Tu pr ê tes ton vélo B tes cousins? No, I do not lend it to them. Non, je ne le leur pr ê te pas.No, I do not lend it to them. Tu montres tes notes B ton copain? Yes, I show them to him. Oui, je les lui montre.Yes, I show them to him. 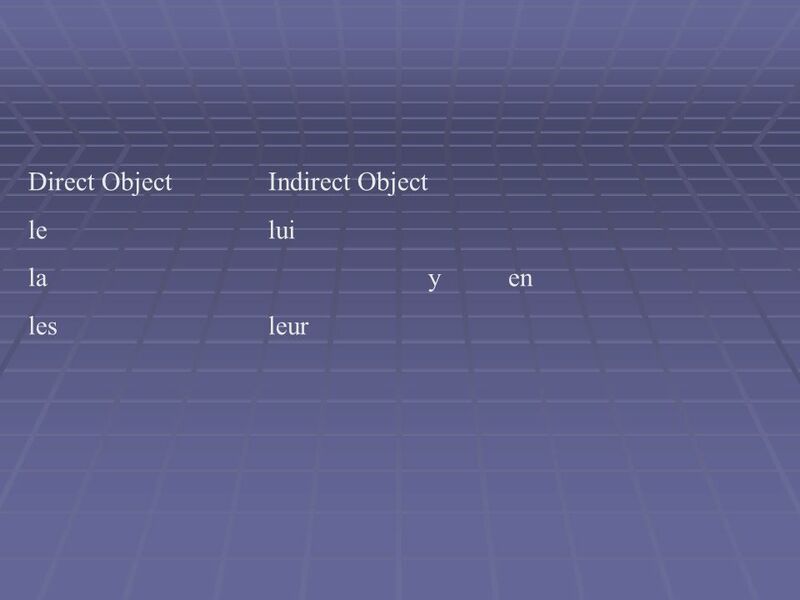 Download ppt "Lordre des pronoms When direct and indirect object pronouns are used in the same sentence, the order is: Direct ObjectIndirect Object lelui la before lesleur." TRADUISEZ: LES PRONOMS DE LOBJET INDIRECT. Write sentences in French. Refer to Study Sheet with Smiley Faces for Word Order. 1.Im reading to him. 2.Read. Le pronom y replaces the name of a place, a thing, or an idea. Le futur proche Near Future: Telling what you or others are going to do. Indirect Object Pronouns. An indirect object is the person who benefits from the action of the verb. The indirect object almost always has à in front. 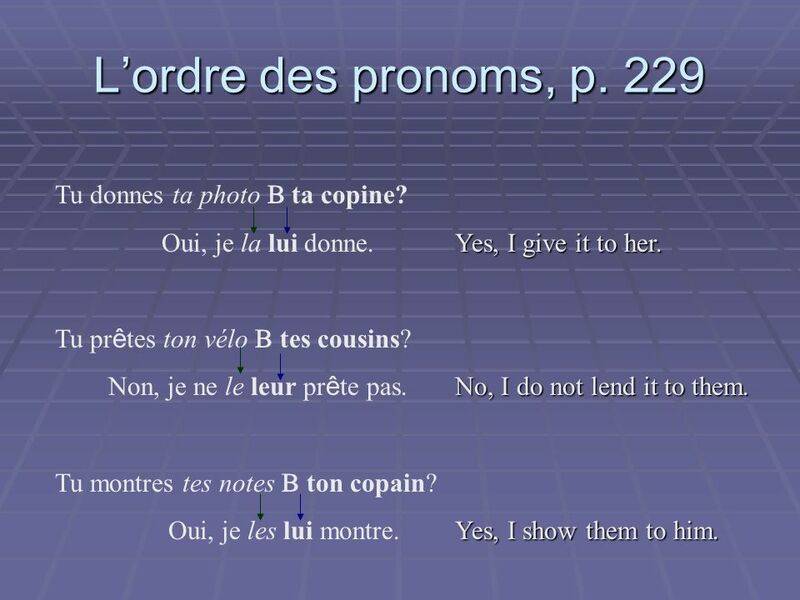 L’ordre de pronoms Sometimes you may wish to replace two objects in a sentence with pronouns. In this lesson we will see where and what order to place. Multiple Object Pronouns Yippee!. Je mange la pomme. Rewrite the sentence to say: I eat it. FRANÇAIS 2E OBJECT PRONOUNS How to go from: Im giving the pen to Jean. Je donne le stylo à Jean. Im giving it (the pen) to Jean. Je le donne à Jean. Im. Direct ObjectTranslationIndirect ObjectTranslation Me To Me TeYouTeTo You LeHim/ItLuiTo Him LaHer/ItLuiTo Her NousUsNousTo Us VousYouVousTo You LesThemLeurTo. FRANÇAIS 2E OBJECT PRONOUNS How to go from: – I’m giving the pen to Jean. Je donne le stylo à Jean. – I’m giving it (the pen) to Jean. Je le donne à Jean.